TS Intermediate IPE Exams Time Table 2015 bie.telangana.gov.in. 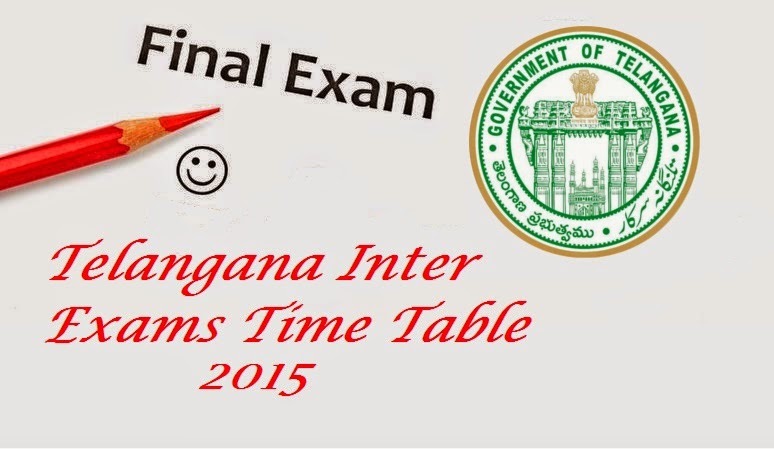 TS BIE Inter Results 2015, TS manabadi inter results 2015, TS BIE Intermediate Exam Time Table 2015 Telangana State Jr Inter and Sr Inter (BOI) IPE March 2015 Time Table / Schedule in PDF Format. TS Intermediate IPE Exams Time Table 2015 bie.telangana.gov.in. New Telangana Intermediate Board of Education formed in 2014 and the Telangana Intermediate Annual Exams 2015 Time Table is released by BIE Telangana for the 12th Class Students studying in (10) Districts of Telangana. The following is the Time Table for Telangana 1st and 2nd year Intermediate Public Examinations March, 2015. Ethics and Human Values Examination will be conducted on 28-01-2015 (Wednesday) from 10.00 AM to 1.00 PM. Environmental Education Examination on 31-01-2015 from 10.00 A.M to 1.00 P.M (One day). Practical Examinations from 12-02-2015 to 04-03-2015 in Two Sessions (Fore Noon: 9.00 A.M to 12.00 P.M & After Noon: 2.00 P.M to 5.00P.M) . New Intermediate Board of Telangana State has officially declared that Intermediate Public Examinations 2014-15 schedule for Telangana IPE Exams 2015 and it has been derived in view of the students participating in various National Level Entrance Examinations and competitive examinations. TS Board of Intermediate is going to conduct IPE Public Exams for the students pursuing First and Second Year Intermediate courses in Telangana State. Time: 9.00 A. M to 12.00 Noon. The above dates are applicable to Intermediate Vocational Course Examinations also. However, the Vocational courses Time Table will be issued separately. You can also download your Telangana State Jr Inter and Sr Inter (BOI) IPE March 2015 Time Table / Schedule in PDF Format. You can just click below provided link and download the Time Table and save / print for your future reference.